Mars has been colonised and named Aqua, a planet with enormous oceans. 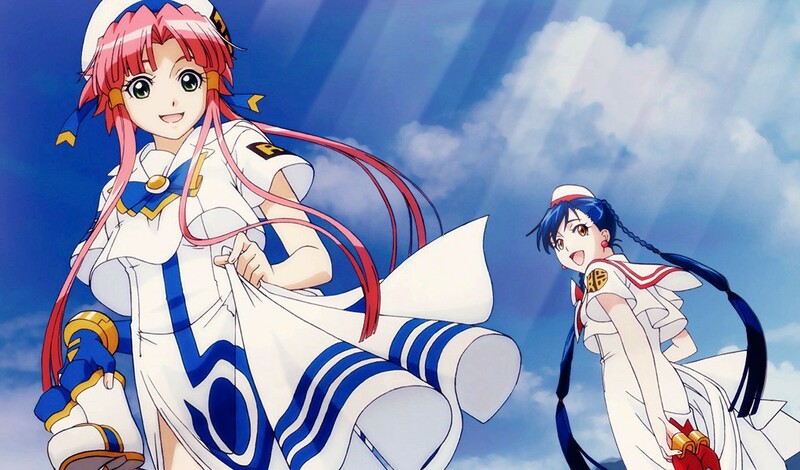 Akari has travelled there to pursue her dream: to become an undine (gondolier) in Neo-Venezia. But for now she’s just an apprentice. The above paragraph makes it sound as if this series has a plot, but it more or less makes a deliberate point of not having. It does have quite an interesting setting, with some nice touches to it and scope for detail. And it has some varied, likeable characters, with nice relationships. What it doesn’t have, in any form, is conflict. A story of apprenticeship is supposed to contain conflict between the character’s childish assumptions and the things they’re learning, between the student and the master, between the master’s wise image and the reality that they’re human too, between competing students, and between those who care about the subject and the outsiders who don’t, and most importantly between the student and him/herself. Aria doesn’t have any of that. Everyone and everything in it is just too nice. Akari doesn’t fail at any point, she doesn’t overcome her weakness, she doesn’t get frustrated or despondent. We don’t even see a flashback to when she told her family that she was going to travel to another planet. It’s pleasant enough to pass the time, it’s quite pretty and has some nice music. But it doesn’t captivate.